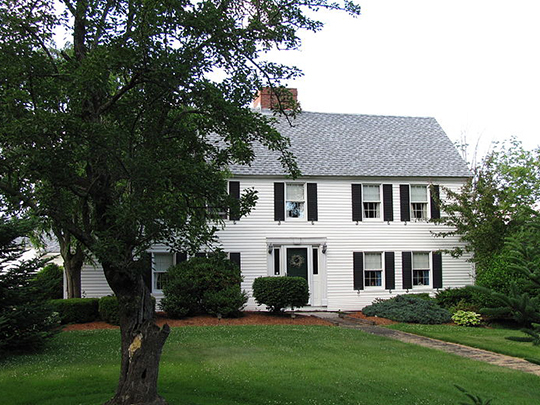 Oxford Town Hall is located at 325 Main Street, Oxford MA 01540; phone: 508-987-6030. Photo: Hudson House, ca. 1720, Hudson Road, Oxford, MA. Listed on the National Register of Historic Places in 1978. Photographed by User:John Phelan (own work), 2010, [cc-by-3.0 (creativecommons.org/licenses/by/3.0)], via Wikimedia Commons, accessed February, 2014. The first visitors to Oxford were the Missionaries, John Eliott, and his friend, Daniel Gookin, of Natick, who were sent by the London Society for the Propagation of the Gospel in New England. In 1674 Eliott and Gookin visited here among the Nipmucks, who numbered about twelve families. The Nipmucks were subject clans of little spirit or distinction. Their number was small, dwellings poor, utensils and weapons rude and scanty. They raised corn and beans and wove mats and baskets but most of their time was spent in idling, fishing or hunting. Their settlement is believed to have been at the site of the park at East Main and Main Streets. The stone they ground corn in, is still there. Oxford originally consisted of a grant of 41,250 acres or about sixty-five square miles. Six and two-thirds miles on the east side, six miles on the west side, ten and one-half miles on the south side and ten miles on the north side. At that time all of Charlton, Webster, the northern part of Dudley and Southbridge, eastern part of Sturbridge, the southern part of Auburn and Leicester and at times land of Millbury, Sutton and Douglas were part of Oxford. Charlton withdrew in 1753 or 1754 and Webster in 1831. Oxford at that time was divided equally between five absentee proprietors, Major Robert Thompson, Dr. Daniel Cox and John Blackwell, of London, and William Stoughton, Esq. and Joseph Dudley, Esq., of Boston. The first settlers were the Huguenots. These people were driven out of France by the Edict of Nantes because of their religious beliefs. A grant of 2500 acres of land in the eastern part of Oxford was given to Gabriel Bernon for the Huguenots by the Proprietors. During the summer and autumn of 1686 the Huguenots arrived in Boston, and came to Oxford in 1687. The Huguenot settlement dated 1687 or there abouts lasted but a few years. The Huguenots were the Merchants, Industrialists, and Craftsmen of France, and a people that France could ill afford to lose. In the time they were here they built a Grist Mill, a Saw Mill, a Glove Factory, a Church and a Fort, and a Garrison House to live in. At first, they got along well with the Indians. New France, which is now Canada, did not like the idea of this settlement and intrigued with the Indians to drive them out. The fur traders traded rum for their furs, which caused the Indians to be in a bad mood, and being urged on by the French Canadians at about this time the tragedy of the Johnson Massacre occurred. The remaining Huguenots bundled up their goods and returned to Boston. They came back twice to try to make a successful settlement, but were finally forced to give up the grant. In 1713, thirty English Families from in and around Boston came to Oxford. The road from Boston to Oxford was but an Indian Trail. A road right for Horseback riding but not for wheeling in your supplies; such as household goods, tools to work with and food to last while you planted and raised your crops. There were a great many hardships the early settlers had to put up with, and conveniences were very primitive. They named their town Oxford. While Oxford was never formally incorporated as a township, yet as early as 1693, the town was represented at the General Court by Daniel Allen, a resident of Boston. In July, 1716 by popular vote, John Town and Ebenezer Learned were sent to the court to search for records of Oxford's grant to a township, and if necessary to petition the court for such. There is no report of the result of their journey. There came to the colony about 1720, a clergyman, a Scotchman, John Campbell, a most able man, interested in civil as well as religious matters, often helping on the military training field. He was not only their legal, but also their medical adviser, and was highly esteemed and respected by all. The first hundred years the chief industry of the town was agriculture. In 1715 the English settlement started a grist mill. In 1745 was the first tannery, and potash was the only article for sale before 1800. Saw mills were built in 1788, and we were making scythes and nails in 1792. In 1798 the manufacture of pig iron at South Oxford, now East Village, Webster, was started. The next hundred years Oxford was becoming industrialized from the sale of manufactured products produced in her newly built shops and mills. There was in 1806, the operating of wool carding machines. Then followed cotton spinning by machinery, a dye house, the manufacturing of cotton and woolen goods, making of broadcloth, shoes, chaise, and harness. In 1822 water-power for manufacturing purposes was used. The manufacture of cotton thread, friction matches, pistols and rifles, were made. These small industries continued to grow, and new ones started, until Oxford was known throughout New England for its school of artisans in millwrighting, fulling-mills and shafts. The manufacture of shoe boxes was started in 1851. In 1722 all frontier towns, including Oxford, were compelled to fortify houses to which families could go in times of attack by the Indians. In 1725, during an uprising with the Indians in Maine, Oxford had considerable trouble with the Indians. It was not safe for a farmer to plough his field without a gun on his shoulder. On March 1775 Oxford acting in accordance with other towns of the province, voted to maintain ten stacks of firearms, at the town's expense, for protection against British invasion. In April came the call to arms from Lexington. The minute men of Oxford were organized under Jonathan Town, who afterwards became Captain. The men of the vicinity were organized under Colonel Ebenezer Learned who was the leading military officer of the town, who became a Brigadier General at the Battle of Saratoga. Both companies marched to Boston to join the army there. They were organized only as minute men until the Provisional Congress sent out a call for 13,500 men for eight months. The Oxford soldiers served in many Battles, among which were Bunker Hill, the Evacuation of Boston and Saratoga, where they rendered invaluable service to their country. Oxford fulfilled her requisition of supplies for her men, and with the other towns, voted for independence. In the fall of 1799, the 14th, and 15th, and 16th regiments were ordered to Oxford for a rendezvous, where they were drilled by veterans of the Revolution. On the death of Washington, President Adams ordered the army to perform funeral honors for the General. Colonel Nathan Rice, in command of the troops at Oxford, invited the citizens and many others in the vicinity to attend and even to take part in the ceremonies. In May 1800, all danger of war over and Congress having ordered the disbandment of the provisional army, Major-General Alexander Hamilton came to Oxford to oversee the preservation of the public stores. He reviewed the Brigade, afterwards complimenting the officers and men for discipline, subordination, dress and decorum. Oxford 250th Anniversary Committee, Historic Town of Oxford, Massachusetts, 250th Anniversary Celebration, Souvenir Program, 1963, http://www.town.oxford.ma.us, accessed February, 2014.